Gavi Gangadhareshwara Temple, located near Bengaluru in Karnataka, is a famous cave temple dedicated to Shiva and annually during Makar Sankranti, the sun's rays pass through a window and touch the Shivling murti worshipped in the temple. The sun’s rays falling from the southwestern part of the temple pass through an arch and a couple of windows placed perpendicular to each other, and later through the horns of Nandi (bull of Shiva) to fall on the idol of the temple for about 15 min (between 4:55 and 5:15 PM) on Makar Sankranti. This annual, ephemeral phenomenon is called Surya Majjana, or the Sun Bath. 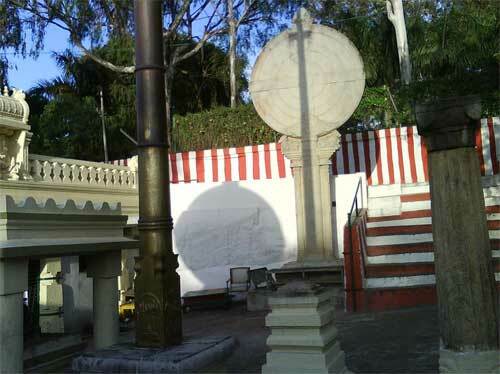 A unique feature of the temple are the two discs in the front yard called Surya Pana and Chandra Pana. They are identical in size with diameter of about 2 m, parallel to each other. Orthogonal lines drawn on the discs on both faces resemble the cross hairs in the eye piece of telescope. The supporting pillar has beautifully engraved bulls in sitting posture. Their orientation appears puzzling because of several reasons. Such discs have not been seen in any other temple. The cross-hair like engraving appears on either side of the disc. They appear to be not aligned to the cardinal points. This temple was formed by the natural boulders of hillocks and faces the south-west direction. The courtyard is wide and has large-sized monolithic sculptures placed in certain alignments. Shiva's symbols, the Trishula and the Damaru, are placed on the southern edge of the courtyard. According to scientists, the sun's rays pass through and reach the Sivalinga-pitha not only on Makar Sankranti (Pongal) but also on November 30 and December 1 every year. The scientists also identified the significance of the Suryapana and Chandrapana monolithic sculptures. According to their study, these were placed for astronomical observations in the medieval period. The shadow of the Dvajastamba falls on the eastern disc for 40 minutes. It is only recently that scholars discovered that the two discs have been installed in alignment to the summer solstice sunset and that explains the significance of the phenomenon on Makar Sankranti. A detailed study has been published in the Current Science Journal [vol. 95, No. 11, 2008]. 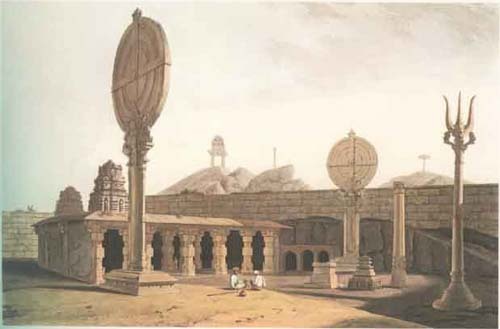 You can read the article about Gavi Gangadhareshwara Temple published in the Current Science Journal in December, 2008 here in pdf format - Astronomical Significance of Gavi Gangadhareshwara Temple. You will need to download it.